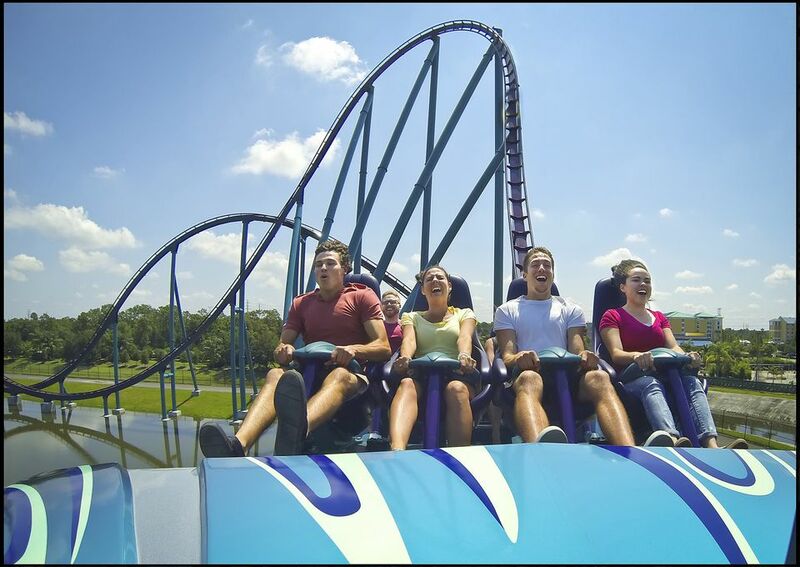 As with Central Florida’s other major theme parks, SeaWorld Orlando is wildly popular. While it may not attract the mega-sized crowds that Disney World and Universal Orlando generate, it nonetheless welcomes lots of visitors eager to experience its marine life-themed attractions, exhibits, rides, and shows. Depending on when you visit, that can mean long lines. And nobody likes long lines, right? To help minimize wait times at SeaWorld, consider our general words of advice for all parks: zag when everybody else is zigging. That is, try to plan your vacations and visits at less busy times whenever possible. If you can, avoid the high-traffic periods such as the week between Christmas and New Year's, the early summer, Easter, and school vacations. The fall, for example, can be a wonderful time to visit the park and commune with the dolphins, stingrays, penguins, and other animals without a crush of other guests. Get to the park when it first opens and make a beeline for one of the attractions likely to have the longest line: Antarctica: Empire of the Penguin, Infinity Falls, and the coasters, Manta, Kraken, and Mako. If you want to see the polar bears, beluga whales, and other creatures (and escape the Florida heat into a chilly environment) at the Wild Arctic attraction and the lines are long, you could bypass the simulated helicopter ride (which is old and dated anyways) and proceed directly to the animal exhibits in the Wild Arctic Habitat. If the lines are prohibitively long at the TurtleTrek attraction, you could nonetheless see the animals swimming in the pool alongside the attraction. If possible, take a midday break when the park is generally the most packed. Perhaps you could return to your hotel for some pool time or a nap. Or maybe you could go to a nearby restaurant for a leisurely lunch. Return in the early evening when the crowds have thinned, and you should find shorter lines. (Be sure to save your ticket and your parking receipt, and get your hand stamped for reentry.) As a bonus, SeaWorld presents special nighttime shows during busier times. Whenever you will be visiting, do some pre-planning. SeaWorld’s official website lists show schedules (and the shows are among its highlights) and other park info well in advance. Develop a rough itinerary so you will have a sense of what you would want to include. Help! The Lines Are Crazy Long! If you will be visiting the park during an especially busy time, and the general suggestions above wouldn’t make enough of a dent in the amount of time you will be spending in line, SeaWorld does offer some nifty options—but they will cost you. For an additional $20 over the cost of Quick Queue, SeaWorld offers an expanded pass includes its newest ride, Infinity Falls. The river raft ride is very popular, and lines can get quite long for it. The park also offers a reduced-price Quick Queue Jr. pass that allows visitors to skip the lines on all of the rides included with the regular Quick Queue, except for the three major coasters. Is it worth it? Only you could answer that. But consider how much you would already be paying for general admission to the park, and then consider how much time you might end up stuck in long lines. Without the pass, you might not be able to fit in everything that you would like to experience. If you had a gang of four, an additional $76 or more to purchase Quick Queue Unlimited passes wouldn’t be chump change (unless you’re lucky enough to be one of those folks for whom money is not an issue), but it could offer good value if you would be able to breeze past long lines, have a relatively stress-free day, and be able to pack in everything on your wish list. Another option that SeaWorld offers is Signature Show Seating. It can be purchased by itself or as part of a discounted package with Quick Queue Unlimited. It offers reserved seating at the One Ocean whale show and the park’s three other shows. Is it worth it? Prices start at $14 per person and rise to $30 during busier times of the year. Generally, the capacities at SeaWorld’s stadiums and theaters are large enough to accommodate walk-ups, provided guests arrive at least 20 minutes prior to show times. If you don’t mind planning in advance and waiting a bit, you should be fine without the Signature Show Seating option. Exceptions might include especially crowded times such as the week between Christmas and New Year's. Speaking of money not being an issue, you could explore SeaWorld’s Private VIP Tour. It includes a guided tour for four hours, includes Quick Queue Unlimited, offers reserved seating for one shows, and tosses in a meal voucher, dolphin encounter, and a penguin meet. VIP tours cost $200 per person and does not include park admission. Would a tour be worth the cost? Again, only you could answer that. While it would offer a generally stress-free day at the park, it is perhaps more about pampering and less about managing lines.